Posted on Fri, Jan 13, 2012 : 2:47 p.m.
Denard Robinson will return for his senior season at Michigan, the university announced today. Record-setting quarterback Denard Robinson and cornerback J.T. Floyd will return to the Michigan football team for their senior seasons, the university announced today on Twitter. Both players took stock of their standing in the eyes of NFL scouts by filing paperwork to the NFL Draft advisory board. College players can use the board to gauge where they might be drafted, if at all. "It's been a dream to play in the NFL, & hopefully after next year that becomes a reality," Robinson was quoted in the @umichfootball Twitter feed. "... but I wouldn't pass up being here w/ my teammates & coaches for anything. It's my second family. I love my teammates, I love Michigan." Floyd, too, was quoted on the Twitter feed, saying, "Being around all of the great people here, I just couldn't see myself not being here for my senior year." Robinson said from the start that he was likely to return for his senior year. He ran and passed for 3,219 yards and 34 touchdowns as Michigan went 11-2 and beat Virginia Tech in the Sugar Bowl. As a sophomore, he set the NCAA season record for rushing yards by a quarterback with 1,702. Floyd broke up nine passes this season, a team high, had two interceptions and forced a fumble. Sat, Jan 14, 2012 : 10:05 p.m.
Great news. Alabama, first on our schedule, lost several seniors plus 3 really good underclassmen. Now we may have a chance of beating them. Alabama's defense this year would have put up a good fight against an NFL team. Sat, Jan 14, 2012 : 3:18 p.m.
@Larry, I do believe Denard will get his shot at the NFL, but I seriously doubt he will play QB, except for &quot;Wildcat&quot; formations. Now anything is possible with another year under his belt, but he would have to make a tremendous jump in technique. I have to be honest, everytime he throws deep, I gasp because he seems to just heave it up like he's playing &quot;500&quot;. Where Denard improved was through the new offense which brought in a more balanced attack and the fact that Hoke found a starting RB to share the load. When Toussaint developed into a quality RB, Denard's play progressed and that is what made the difference. His statistical improvements were due to the coaching staff and what they set out to do when they took over and that's make Denard look like a &quot;college QB&quot;. We were very lucky that plays were made by our WR's this season and fortunate that our opposition couldn't capitalize on Denard's mistakes. Don't get me wrong, Denard is still one of the most exciting players in college football but he is usually a liability on passing downs. Let's make 2012 better for Denard Coach Hoke, and we may get that Conference title. Go Blue! Sat, Jan 14, 2012 : 1:59 a.m. According to prison guards... Daryl Stonum is now off the team. Probably won't be announced until next week. The right decision for Hoke. Sat, Jan 14, 2012 : 5:14 p.m.
Just FYI it is hearsay But it appears credible. Sat, Jan 14, 2012 : 4:44 p.m. Very interesting how some of this information gets through. I am very inclined to believe @braggslaw and I will pay attention during the course of the next week for the formal announcement ..you (we) heard it here first. Sat, Jan 14, 2012 : 4:34 p.m. Sat, Jan 14, 2012 : 12:17 a.m.
Another FUN year is at hand. Go BLUE! Fri, Jan 13, 2012 : 11:04 p.m.
Studies have show that the happiest people make $75k a year. More than that and it is a steady decline. I think 75% of all NFL players are bankrupt within 5 years of their NFL career ending. It's somewhat hihgerr for NBA players. No one talks about that during NFL or NBA strikes, player hold outs, kids jumping to go pro early. The consensus is it's &quot;smart' to go for the big bucks. The opposite is true. Money only 'helps&quot; buy one happiness up to the point were they can pay the bills and not have to worry. After that it usually comes to own and control and change a person for the worse. People, agents, lawyers, con men want to be your friend because you have money. One starts to forget who they really are and what's important. Who among us &quot;adults' would give up one of the best years of our youth, with friends and people we love, to start making money one year early? Like that line from the movie stand by me. &quot;I've never had friends like I did when I was a kid. Does anyone&quot;. Sat, Jan 14, 2012 : 9:18 a.m.
well mick, considering AA is in the midwest, what do you think he's talking about? 75000 is far above average income around these parts, and you could definitely do more than get by. If you wanna go live on the west coast or something then deal with the cost of living.. Ive spent plenty of time there, and i dont have any desire to return. Midwest weather can be rough in some places (for the senior citizens, (mick)), but you cant find better people. (not saying everyone outside of the midwest is bad). But on a more related note, im glad those two are back. They will both make a huge impact next season, and hopefully can help lead UM to a B1G title shot and beyond. Sat, Jan 14, 2012 : 2:20 a.m.
$75,000 is not gonna cut it in high cost of living places like I live in, so please give me a break. One might be able to get by but not live comfortably. Where you talkin' about Scott? The Midwest? Fri, Jan 13, 2012 : 10:55 p.m.
By the way -- in unrelated news, in case you missed it -- U of Arizona landed Casteel for DC. Now things get interesting. So glad they are staying! GO BLUE! Fri, Jan 13, 2012 : 10:48 p.m.
GREAT NEWS GUYS. THE DEGREE YOU WILL GET IS FAR MORE IMPORTANT THAN FOOTBALL. THOSE WHO STAY WILL BE CHAMPIONS. THESE WORDS ARE SO TRUE FOR THAT DEGREE IS THE BEST THING EXCEPT SEEING YOUR CHILDREN BORN THAT WILL EVER COME YOUR WAY. Sat, Jan 14, 2012 : 4:47 a.m. Sat, Jan 14, 2012 : 1:15 a.m.
Fri, Jan 13, 2012 : 10:34 p.m. Sounds like a smart decision by both of them, and it will be great to have them back for the 2012 season. I think we will see a much improved Denard at QB. Al Borges has done well handling and coaching QB's in the past, and Denard is humble enough to continue to want to learn and improve. Fri, Jan 13, 2012 : 9:39 p.m. In some cases it makes sense for guys to leave early and head to the NFL. In the case of Robinson and Floyd it didn't. They're back for another year. They'll benefit from it. So will Michigan. Sat, Jan 14, 2012 : 2:14 a.m. The great DonAz telling it like it is, in a nutshell. Fri, Jan 13, 2012 : 9:34 p.m. Sat, Jan 14, 2012 : 2:01 a.m.
Denard is a good guy... he is what he is. If you want the dynamic playmaker you have to tolerate the interceptions. Fri, Jan 13, 2012 : 9:47 p.m.
From the article: &quot;Sports fads go in cycles, and Alabama-LSU, a title matchup of low-scoring power-football philosophies, may signal that the pendulum has begun to swing back.&quot; I think it has. Urban Meyer said as much when discussing what he'll incorporate into OSU's offense. Fri, Jan 13, 2012 : 9:33 p.m. I don't fault them for sticking a toe in to see if their would be pro interests. But I hope they also factored in that their lives, if they were to go pro would be a whole lot different and not all for the best. Often it has been too much too fast for a relatively young man. Here they still have somewhat normal lives and although they are recognized around campus and town they are mostly left alone. Once players go pro they have to adjust to more people just wanting to latch on to them. They would never get that time back, an extra year of thier young life. If they have the ability the pros will still be there next year. Fri, Jan 13, 2012 : 9:20 p.m.
We can't fault both of these guys for getting information to make a decisio, with 1st round money they can fly their teammates out to visit and take a limo to classes to finish their degrees. It's great that the NFL made the decision so quickly (unlike the NCAA in the case of Practice-Gate), so that these guys can now focus on the 2012 season. Go Blue! Fri, Jan 13, 2012 : 8:46 p.m.
As Rude Jude states...&quot;except first rounder money, of course.&quot; Very true and that's just reality. I am very sure both Denard and J.T. Floyd really love the University of Michigan and their teamates are really like a second family. Let's look at it this way: now that both of them know their NFL stock is low, they can really focus on more success in their senior seasons. (A sigh of relief.) There will be no looking over their shoulders toward what might be with the NFL. So this saga is over. Hence forth, it is about the 2012 season. Denard and Al Borges can delve into the play book. Denard can learn to execute his plays better. He can now tap is two full years of playing experience to become a better QB on the road. He'll need to do that since the Maize and Blue play six games away from the Big House. J.T. Floyd can strive to be First Team Big 10 Cornerback or better as an All American. 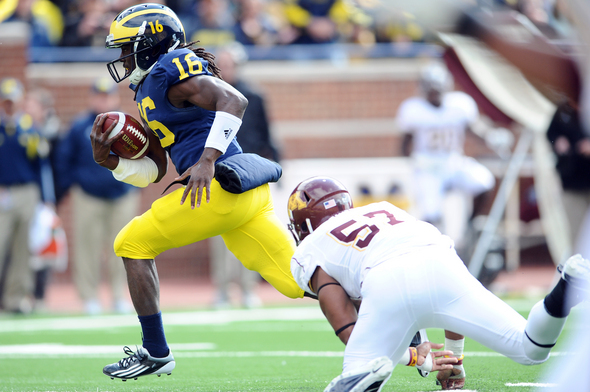 If Denard can play as well on the road as he does at home, he'll be a Heisman finalist. A big if, but that is the key to Michigan's success in 2012. Fri, Jan 13, 2012 : 9:09 p.m. I'm a big fan of Denard and UM Football. However, I disagree on Denard being a Heisman finalist next year. He's a very good, one-dimensional QB and I think he's hit his ceiling. I would rather see him as a kick/punt returner and receiver. He has a better shot at the Heisman and making the NFL in that role --- similar to Desmond. Fri, Jan 13, 2012 : 8:34 p.m.
&quot;... but I wouldn't pass up being here w/ my teammates &amp; coaches for anything.&quot; Except first-rounder money, of course. Glad both are back, but just being real. Sat, Jan 14, 2012 : 2:57 p.m.
Andrew didn't grow up in the ghetto. His father makes close to a million dollars a year at WVU. I haven't even heard if Denard has a father. Tell that to andrew luck.